A minimum of $80 (plus tax) deposit is required to reserve your spot. Full balance of course fee must be received by Sunday February 24th, 2019. Course fees are non refundable. Taxes added at checkout. This course requires a minimum of 4 people enrolled to run. Materials Required: Bring a pen and note book (or whatever you would normally use to take notes). Printed hand out sheets will be provided. On choreography days you will be required to wear comfortable workout clothes such as yoga pants and a tank top. Attendance: Ensure that you arrive a few minutes early to fill out studio waiver form. Class will start promptly at 3pm. If you will be unable to attend session please let us know as soon as possible; sessions will not be repeated but course notes will be provided. Workshop fees are non refundable. Learn how to make your very own pair of decorative tasseled pasties and how to twirl them in this 90 minute workshop, just in time for Valentines Day. 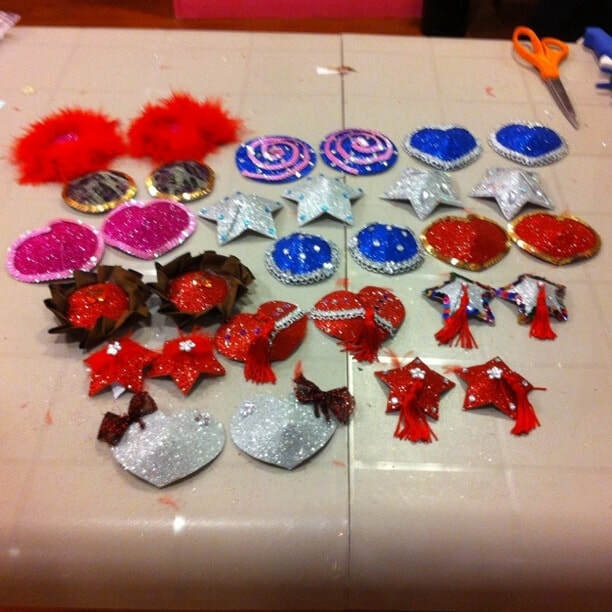 All materials provided to make one set of self adhesive pasties you can take home at the end of the workshop. This class involves mild aerobic activity; please go at your own pace and take breaks as needed. There will be a brief intermission between the pasty making portion and movement portion to allow for space change over and bathroom breaks. All body types, all ages (19+), and all genders welcome to participate. Attendance: Ensure that you arrive a few minutes early to fill out studio waiver form. Class will start promptly at 3pm. Workshop fees are non refundable. Attire: Wear comfortable clothing that is easy to move around in such as yoga pants/leggings and snug fitting tank top/t-shirt/sports bra (fyi we will be sticking pasties to the garment with removable tape backing). For shoes wear clean sneakers, dance flats, or low heel character shoes. This class will not require students to practice an actual strip tease.